No one knows where they come from, or why they’re there. All most people know is, when they hit, they’re hard to ignore. We’re overwhelmed with cues that signal to us that it’s time to eat, no matter where we are or what we’re doing. The boundaries that we should have around meal time and eating have slowly disintegrated over the years, opening us up to feeling that it’s not only okay to eat regardless of time or place, but that we shouldn’t have any standards or rules around what we eat. Eating whenever without caring about whatever we eat, combined with the need to eat immediately, leaves us open to simply eating whatever is most accessible. Usually, that’s the most unhealthy stuff around. Over the years, I’ve figured out that one of the things that makes it hard for me to turn away cravings is the ever-present nature of sugar. Not only does everything taste sweet, but everything smells sweet. Everything just has to smell like cookies and cupcakes and candy and vanilla and I mean…you can hold off on indulging a craving for long enough, but it’s not just your mind you’re “battling” with—it’s the world around you. Soon enough, you’re ill-equipped to win the war. The craving is so powerful, the need to relieve anxiety caused by general purpose stress and the anxiety from “depriving” yourself is so great, you over do it. And then, you’re ashamed of how far you’ve gone. 1—Lipsticks, lip glosses, and lip balms (or, if you’re country like I am, you call them all “chap sticks”). For some reason, fancy lip stuff has gravitated towards everything having a sweet flavor. Ha ha—it’s not “some reason,” the reason is actually quite clear: if it tastes good, you’ll keep licking it until you lick it all the way off, resulting in your constantly reapplying and constantly licking it off. So, when your lip balm tastes like “cherry” or your lip paint tastes like “peppermint,” remind yourself that there’s a “sweet” reason why you keep running out of it so quickly.. and have to keep constantly buy new batches of it. That’s part of the reason why I gravitated towards lip balms that are natural and more organic—the fewer the ingredients, the less likely they are to contain sweeteners. 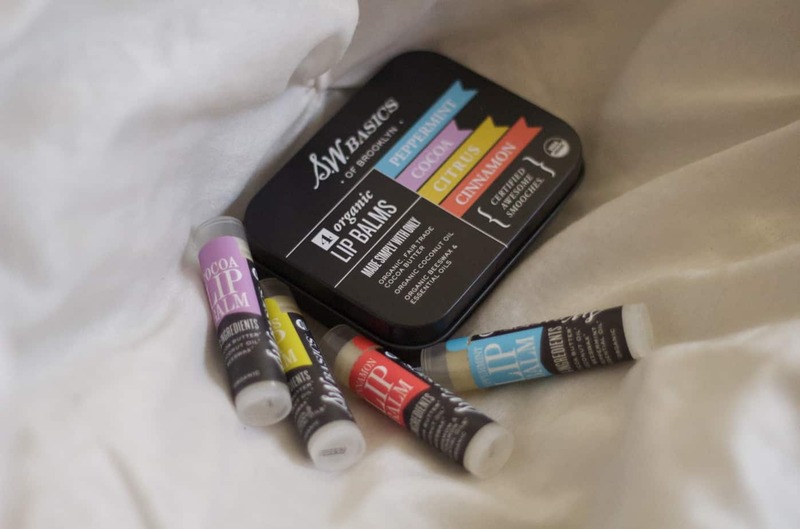 If you’re looking for a (completely unsponsored) recommendation, my personal favorite is the Organic Lip Balm Flight from SW Basics (pictured above), and has been for years, now. There’s a scent to it—cinnamon, peppermint, citrus, cocoa butter—so, by extension, there’s a taste. But it’s not sweet, so you don’t feel compelled to lick it off. You forget it’s there, and your lips remain soft. 2—Fragrances. Recently, in a women’s magazine—pardon my eyeroll—they were making suggestions for the kinds of fragrances that women should wear for certain situations… on a date, at work, every day, things like that. Well, first of all, if you know anything about chocolate (which, well, I do), you know that what you’re actually smelling in chocolate is….vanilla. Vanilla is added to cocoa to give it the scent we’re so accustomed to when we eat it. Secondly, just about anything that smells outwardly and deliberately like vanilla also smells like cookies because… well, just about every cookie out there has vanilla extract. And, by extension, you also smell like most cakes and muffins. Thirdly… candy? C’mon, son. C’mon. 3—Toothpastes and mouthwashes. If you flip over your toothpaste, you’re likely to see the second ingredient as a xylitol, sorbitol, stevia, or some other form of sweetener. Why is your toothpaste sweet? Does it make sense? Yes. Does it play on an already taxed will power by manipulating you into doing something, even though that something is good for you? Yes. The same goes for mouthwashes. It’s frequently sweet, almost to an unbearable degree to me. I may not be advocating simply sticking your toothbrush into a container of baking soda (I mean, maybe I am? ), but finding a toothpaste and mouthwash that doesn’t have an ingredient on the dreaded “hidden sugar” list. I’m also going to tag those little floss picks in here, too—the strings in those are frequently coated in sugary flavoring. Be mindful with those, too. So, imagine my shock when I found a “salted caramel” candle? And then imagine my horror when I found a slurry of candles all designed to make your home smell like, well, food? Not only that, but some of these household cleaners are doing too much, too. They tell you the scent is “lemon basil,” but it smells like a lemon jolly rancher—yes, I know—in your house? I gravitate towards things that smell less sweet—like ice cream that I might sell my first born on a board day for—and more like the ocean, fresh bread, or fresh laundry, or Money House Blessing. I don’t know. Just not cookies or candy. Or crack. Don’t get me wrong—not everything is a sinister plot to make you a miserable sugar-hungry lunatic. Alas, if the ultimate result is you become so accustomed to everything being sweet that you find it more difficult to turn the sweet things in life away? Then isn’t it time to make some switches? I sure did. Where have you had to swap out some sugary scents? What are your favorite non-sugary scents and swaps?